Doubt as to Collectibility (“I can never pay the IRS what I owe them.”) – If a taxpayer cannot pay his or her tax liability in full, he or she may be eligible for an Offer in Compromise based upon this ground. We perform a thorough financial analysis to determine whether you are eligible for this type of Offer. If you are eligible, we calculate the dollar amount that the IRS may be willing to accept. This program is a wonderful way to eliminate one’s tax liability for pennies on the dollar. Our taxpayer was previously a successful commodities trader with The Chicago Board of Trade and was self-employed. Because he was so successful in his business, our taxpayer incurred a substantial tax liability, at one point reaching $1.6 million. Because of a downturn in his business, our taxpayer’s income substantially dropped, he lost his ability to trade commodities and had to entirely change his career. Our taxpayer then worked as a delivery driver earning substantially less money than he did in the past. We filed an Offer in Compromise on behalf of our taxpayer and settled the case for $2,000.00 against a $1.6 million dollar liability. Our taxpayer is now free of his prior debt to the IRS. If you look at the IRS Offer in Compromise Form 656, it looks quite simple to fill out. It seems as if you can simply check a few boxes and file your Offer with the IRS. This approach is the worst possible thing you can do. Long before filing an Offer in Compromise with the IRS we perform pre-Offer planning for our clients to ensure that they pay the lowest possible amount to the IRS under an accepted Offer in Compromise. For example, we sometimes recommend that our taxpayer move into a nicer home or apartment, attend to existing health issues including dental procedures and medication, purchase health insurance and life insurance and even buy a new car. All of these items can be expenses allowed by the IRS which, in turn, reduces the amount that the IRS may be willing to accept under an Offer in Compromise. 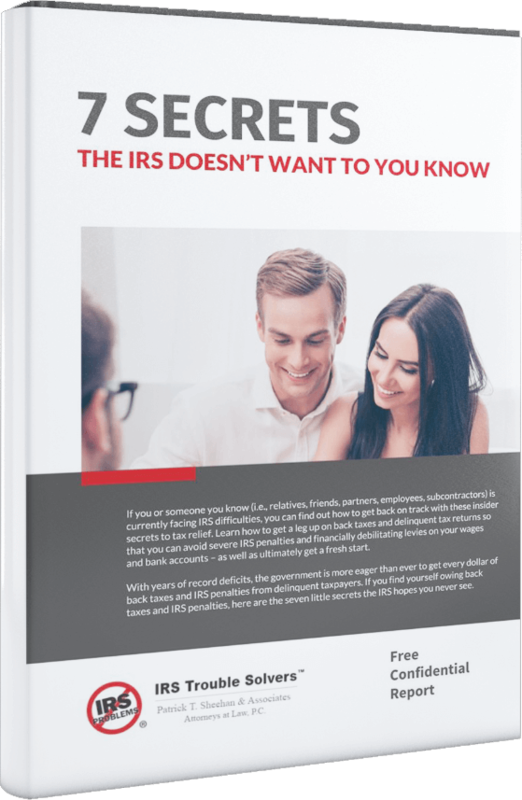 Failure to conduct pre-Offer planning often leads a taxpayer to needlessly pay more than they need to the IRS under an accepted Offer in Compromise or to make them ineligible to file an Offer in Compromise. Pre-Offer planning is especially important if you have unfiled tax returns and are married. When our married taxpayers came to us, they had not filed tax returns for many years. The wife was a W-2 employee and was withholding at the correct level. However, the husband was self-employed and did not make any estimated tax payments. As a result, the liability, if they filed joint tax returns, was approximately $100,000.00. Our taxpayers collectively had assets in the approximate amount of $100,000.00, meaning that they were likely not eligible for an Offer in Compromise. Utilizing pre-Offer planning, we filed Married Filing Separate tax returns on behalf of our taxpayers and the husband intentionally incurred a Married Filing Separate liability of approximately $120,000.00. Utilizing this strategy, the wife was not responsible for the husband’s liability. Further, this strategy allowed us to split the value of their joint marital assets so that the IRS could only attach one-half of the marital estate or $50,000.00. The IRS accepted the Offer in Compromise we filed on behalf of the husband for $50,000.00 instead of taking the entire marital estate valued at $100,000.00. Our taxpayers remain married, no longer have a debt to the IRS and still have assets worth $50,000.00. Case study: Retired Couple Gamble With Retirement SavingsA husband and wife retired to Las Vegas to enjoy their golden years. If you have ever been to Las Vegas, you know that slot machines are everywhere including the airport, gas stations and grocery stores. The wife, on her daily visits to the grocery store, began gambling and became addicted to slot machines. In the span of only one year the wife gambled away $200,000.00 in retirement funds, all at the grocery store. As a result, not only did the couple have unpaid liability due to the IRS stemming from her use of their retirement funds, she also had gambling income for the few wins she enjoyed at the slot machines. We filed an Offer in Compromise on behalf of our taxpayers and paid the IRS pennies on the dollar. Our taxpayers can now truly enjoy their remaining golden years without fear of the IRS. Case study: Wife’s Excessive Spending Leaves Husband With No Money for Tax LiabilityA husband and wife had a contentious marriage. The husband was self-employed and the wife stayed at home. As their marriage began to crumble, the wife began to make outrageous purchases and spent all of the couple’s money. As a result, they were unable to pay the substantial tax liability listed on their tax returns. Not surprisingly, the couple soon divorced and the court awarded all of the IRS liability to the husband. We filed an Offer in Compromise on behalf of the husband and paid far less than what the IRS said was due. Our taxpayer is now enjoying his single life free from the prior IRS debt.